The mobility of the oil can be improved by reducing its viscosity (increased GOR or higher temperature), increasing the oil’s volume (miscible displacements), increasing oil’s relative permeability and reducing the residual oil saturation (low interfacial tension surfactant flooding) or reducing water’s mobility (polymer flooding). 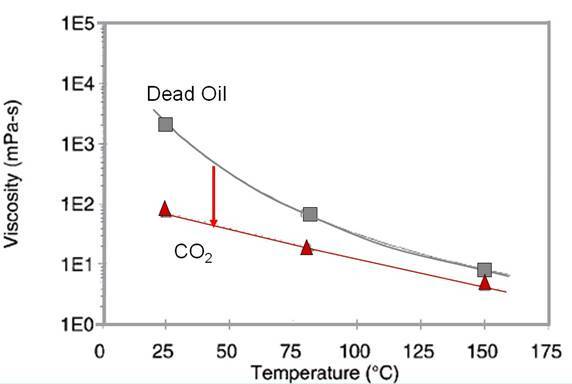 The following figure, for a heavy, viscous oil, shows that increasing the GOR by injecting CO2 can lower an oil’s viscosity a factor of ten or more at low temperature and lower the viscosity a factor of two at steam temperature. This results in even larger changes in oil mobility because an oil’s volume and relative permeability increase at higher temperature and increased GOR. The last relationship can be used to show how effective several improved oil recovery techniques will be. This is shown in the figure below where fractional flow of oil is plotted for several viscosity ratios (μo/μw) of oil to water versus the water saturation for several oil recovery techniques. The first line (left) on the graph is for water displacing oil (μo/μw 300). This line crosses the economic limit line (3% oil cut) at 48% water saturation, i.e., 45% of the oil is recovered in a completely swept zone. The second line is for water and gas displacing the oil. Now, the viscosity of the oil has been reduced by a factor of 3 (μo/μw100), and the economic limit is at 54% water saturation. This means that 61% of the oil has been displaced in a swept zone. The third curve is for μo/μw of 50, a polymer flood with no adsorption. Now, the curve moves farther to the right but the economic limit rises because polymer costs approximately USD 0.7/barrel of injected water. Likewise, when the oil is heated with steam, which costs USD 2-3.50 per barrel to make, the economic limit also rises, so that polymer and steam might recover 68% and 73% of the oil in a swept zone, respectively. Now, oil heated by steam generated with in situ-combustion may only cost USD 0.74/bbl, so the economic limit would be higher than that of steam and in-situ combustion could be an attractive EOR technique.